The Tellurium clock reproduces the annual orbit of the earth around the sun, with the earth rotating around its own axis once in 24 hours. The moon, in turn, revolves around the earth in 29.5 days completing a full rotation around its axis. This allows the reproduction of the different moon phases as they are visible from earth. In the course of one year, the earth passes all 12 zodiac signs, months and individual days which are indicated on the flat disc. 8-day spring wound movement with 4/4 Westminster chime on 4 polished bells. 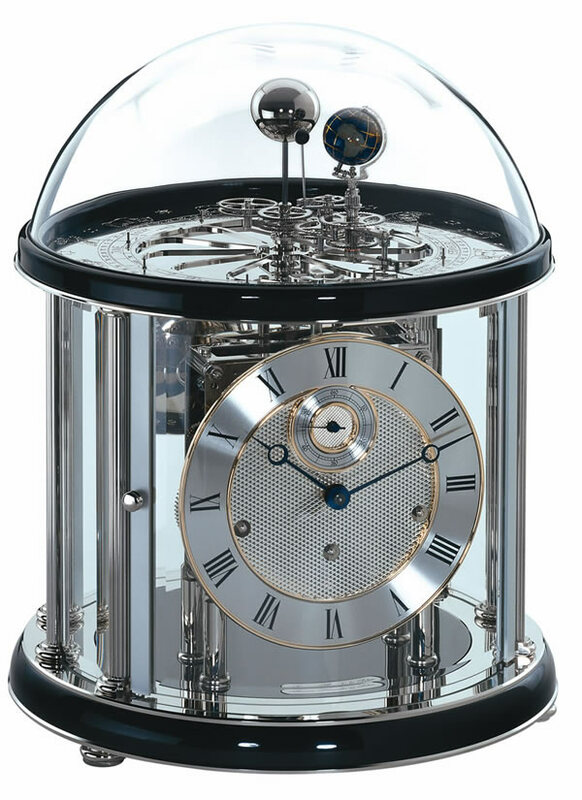 Separate second feature, 11 jewel deadbeat escapement. Polished brass disc has milled zodiac signs and rosettes in addition to the months and days of the year. The Tellurium has reproductions of the sun, earth and moon, incorporating the day/month indicator. Automatic night shut-off.